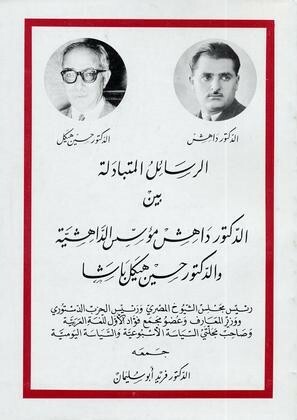 In the summer of 1951, the famous Egyptian writer, Dr. Mohammad Hussein Haykal, an ex-president of the Egyptian Senate House and the then proprietor of the two Egyptian newspapers, The Weekly Politics and The Daily politics, visited Lebanon. He heard the news of the oppressive persecution campaign mounted against Dr. Dahesh at the hands of the then President of the Lebanese Republic, Beshara el-Khoury; so he wrote to the Daheshist poet, Halim Dammous, expressing his desire to assist in defending the cause of a man unjustly persecuted. This letter to the Lebanese poet initiated a correspondence between Dr. Haykal and the founder of Daheshism, who was at that time unjustly stripped of his citizenship and living away from public view. The letters of Dr. Dahesh mostly reveal the causes of persecution and the so-called “legal” procedures of the thinly veiled conspiracy against him, and his determination to restore his rights. On the other hand, the letters of Dr. Haykal express his view that stripping a person of his citizenship is worse than a death sentence by a firing squad. These letters express Dr. Haykal’s avowal to stir up Dr. Dahesh’s case in the Egyptian press in a manner similar to Voltaire’s defense in the famous Calas case.